SATB. Composed by Javier Busto (1949-). Octavo. 8 pages. Walton Music #WGK122. Published by Walton Music (GI.WGK122). Latin. Text Source: traditional liturgical Latin. The beautiful choral writing of Javier Busto speaks to the heart. His "Ave Maria" is one of the great works, which permits a choir to perform to the fullest, emotionally as well as technically. A fine choice for a festival program. 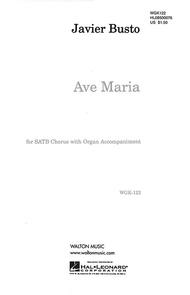 Available: SATB. This is a gorgeous 'Ave Maria' setting that sounds great but is fairly easy to sing. This piece has been selected as the very first favourite piece of the month of Musica International database. 17 of 36 people found this review helpful.